The States' newest military unit is looking to blast off with a distinctive design. The term 'Space Force' has been kicking around the headlines for a few months now, often accompanied by background chuckles and wry smiles. But it looks as if the new US military branch is one step closer to lift off if these potential logo designs are anything to go by. For the uninitiated, the space force is the proposed US military branch that looks to protect America from what Vice President Mike Pence describes as "the growing security threats emerging in space." How can designers deal with plagiarism? It's easy to dismiss anything space-related as the preserve of science fiction and wishful thinking, and it often feels that out-of-this-world ambitions are trumpeted whenever a President is looking to get re-elected. But given the unpredictable state of world affairs, we wouldn't be surprised if Space Force became a reality. To herald the arrival of Space Force, Trump 2020 re-election campaign manager Brad Parscale sent an email to supporters asking for their thoughts on a potential logo design. Sent on Tuesday, the email read "President Trump wants a SPACE FORCE – a groundbreaking endeavour for the future of America and the final frontier." It went on to highlight the potential commercial opportunities in sight: "As a way to celebrate President Trump's huge announcement, our campaign will be selling a new line of gear." Check out the potential logos below. If one logo stands out from the crowd for us, it's the first one. As well as being the only design to eschew the rocket icon, it also bears an uncanny resemblance to the NASA logo. Cynics have written off the email as a cash grab piece of marketing as, upon voting on their favourite design, participants are presented with a campaign fundraising pitch. And with the email from Parscale specifying that the logo will appear on merchandise, it seems that the almighty dollar is (perhaps not surprisingly) a driving influence behind the vote. Unsurprisingly, designers have weighed in with their critical and humorous takes on the selection of logos on offer. This isn't the first time the Trump administration has been criticised over its graphic design choices. Earlier this year Melania Trump's Be Best logo came under fire for its clumsy execution and similarity with other people's work. 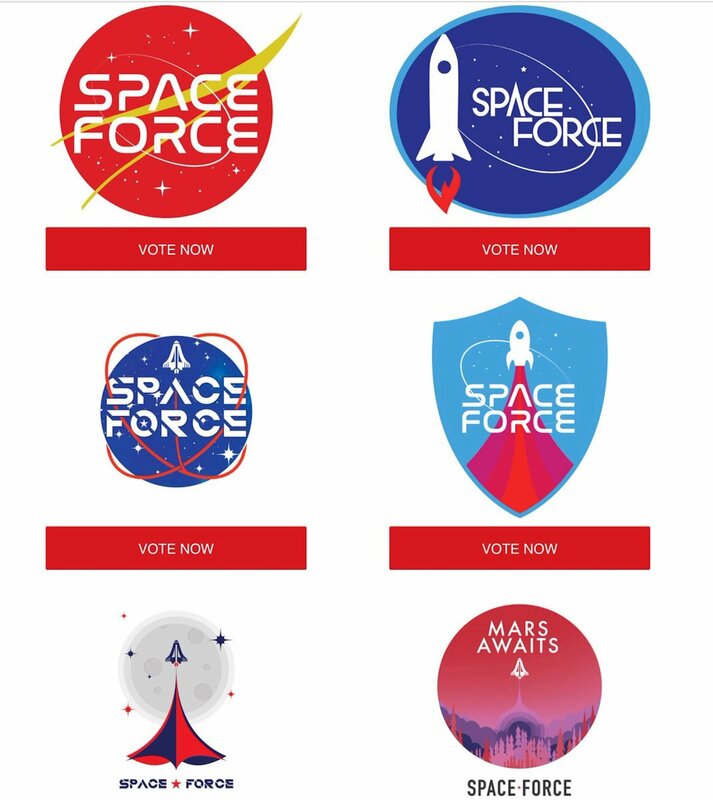 Only time will tell if one of these Space Force designs becomes as big as the Make America Great Again baseball cap, but in the meantime, in the words of the President himself: "Space Force all the way!"